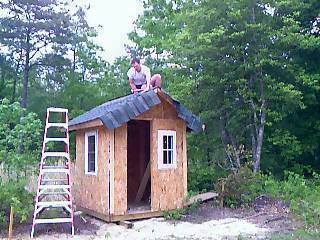 My husband and I (who have no building experience) built this coop with plans we found on the internet. 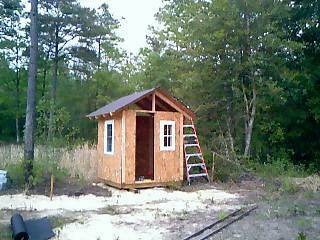 The coop is 6x6' and the attached run is 15x30', which should suit our 8 hens nicely. It sits on 4x4 skids, so it can be moved if needed. We did modify the plans some, which I'll mention as we go through the design. The plans were very easy to follow, the only tricky part being the roof. We wanted a steeper pitch, so we had to refigure some of the angles to allow water to drain off more quickly. Here are the plans that we got from the website. 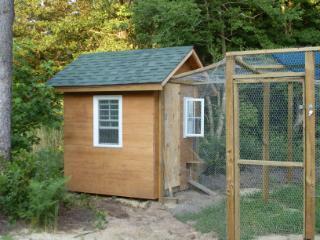 Another major change we made, was putting the nextboxes inside the coop, rather than putting them through the wall. 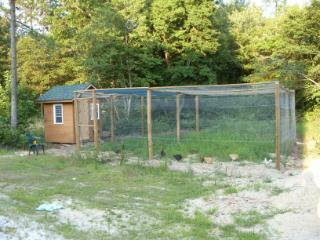 We live in a wooded area, with lots of predators, so we thought the fewer entrances to the coop, the better. We added 2 windows. One which was leftover from one of my husbands projects, the other we got from the returns/damaged section of Lowes. We also upgraded the roof. The plans call for roofing boards, but we had leftover 30-year architectural shingles leftover from our house, so we used those. Once the walls were finished we covered the house with foam insulation board, to cover any seams and provide a little insulation. At this point we added the 10x12" hole for the chicken door. For the exterior of the walls we used Barnyard siding, which we bought on sale. We stained the siding with woodguard stain we had leftover from our house. We cut a piece of plywood for the door, and reinforced it with 2x4's. The door opens swinging out, and a removable litter board was installed to keep the pine shavings from falling out. A look inside, you can also see how our chicken door is set up. At night it is locked with a leash-type clip. We added a 1x3" roost next to the window, they love to sit on it and peek out. 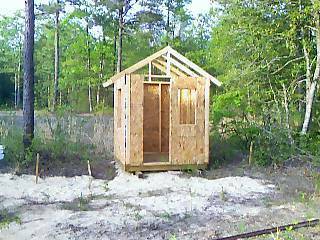 We started the 15x30' run by attaching pressure treated 2x4's to the front of the coop. Then we set pressure treated 4x4 posts every 10' around the perimeter of the run. We bought pressure treated 16' 2x4's to support the wire on the ceiling of the run. We dug a 1'x1' trench along the perimeter of the run, so the wire can be buried one foot deep, and one foot out to prevent predators from digging under the run. The run is covered in 1" chicken wire. Although it is not the most sturdy material, the chickens will be locked in the coop at night to prevent attacks from predators. And last, but not least...a picture of the girls! I've planted some lily bulbs, inspiration from Buff Hooligans, around the door to the run. My Buff-Laced Polish is named Cyndi Lauper...so I want to add a sign to the coop that says "Chicks Just Wanna Have Fun"!